These 10 new books are a fantastic mix of horror, space stories, and magic. Find Cthulhu, space pirates, and Elemental Master Sherlock Holmes all on this week’s list! 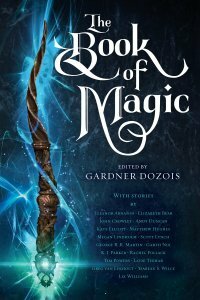 Gardner Dozois’ anthology The Book of Magic, Steven Erikson’s Rejoice, a Knife to the Heart, John Scalzi’s The Consuming Fire, and titles by Lila Bowen, Paula Guran, S.T. Joshi, Ausma Zehanat Khan, Mercedes Lackey, Tim Major, and R.E. Stearns. Dark fantasy novel, fourth in a series following Wake of Vultures (2015), Conspiracy of Ravens (2016), and Malice of Crows (2017), about a half-breed girl who can see the evil that other people are hiding. • Hachette’s site has this description with an excerpt. • Lila Bowen is a pseudonym for Delilah S. Dawson. Anthology of 16 original fantasy stories. • Authors include George R.R. Martin, K.J. Parker, John Crowley, Eleanor Arnason, Andy Duncan, and Scott Lynch. • Penguin Random House’s site has this description with a preview function. SF novel of alien first contact in which the aliens are reluctant to appear but intervene in human society to end all violence. • The Canadian publisher’s site has this description with blurbs by Robert J. Sawyer and others. • The near-simultaneous UK edition from Gollancz is due October 18th. Anthology of 29 dark fantasy and horror stories first published in 2017. • Authors include Rebecca Roanhorse, Priya Sharma, Cassandra Khaw, Jeffrey Ford, Kai Ashante Wilson, Steve Rasnic Tem, and Robert Shearman. Anthology of 21 original stories inspired by H.P. Lovecraft. • Authors include Darrell Schweitzer, William F. Nolan, Nancy Kilpatrick, Steve Rasnic Tem, and Stephen Woodworth. • Titan’s site has this description. Fantasy novel, second in a series following The Bloodprint (2017), about a group of female warriors battling a superstitious patriarchy that suppresses knowledge and subjugates women. • HarperCollins’ site has this description with a sample. Fantasy novel, thirteenth book in the Elemental Masters series, following Fire Rose, Gates of Sleep, Serpent’s Shadow, Phoenix and Ashes, The Wizard of London, Reserved for the Cat, Unnatural Issue (2011), Elemental Magic (2012), Steadfast (2013), Blood Red (2014), From a High Tower (2015), A Study in Sable (2016), and A Scandal in Battersea, about Sherlock Holmes in an alternate 20th-century England. • Penguin Random House’s site this description. Young adult horror novel about a creepy English village. • ChiZine’s site has this description. SF novel, second in a series following The Collapsing Empire (2017), about the gradual collapse of the extra-dimensional conduits that enable travel between the stars. SF novel, second in a series following Barbary Station (2017), about two unemployed engineers who’ve survived a murderous AI and joined a pirate crew. • Simon & Schuster’s site has this description with a Google preview. These listings are based on publisher schedules and availability on Amazon (rather than on confirmation of physical publication via purchase, review copies, or sightings in bookstores). Titles are listed only once they are published (with rare exception). We do not list galleys or advance reading copies. Page counts are based on publisher or Amazon listings, and typically only approximate the bibliographic page counts of finished books.